Creating tie-dyed fabrics and articles of clothing can be a lot of fun—some of it messy—but, if you are mindful about it, wear protective gear, and cover the area, then clean up should be a breeze. One of the best ways to prevent getting splashes of color all over the house is to take the tie-dye project outside or to the garage. Unlike other projects, "tied" creations remain a mystery until they are untied and reveal a variety of new, colorful treasures. You can create your own colorful t-shirts, other articles of clothing, matching sheets, pillowcases, and curtains, too. It's easy if you follow some simple directions and suggestions. Tie-dye is a term for a technique of coloring fabrics that involves folding, twisting, and crumbling fabric and then tying it with string or rubber bands tightly. Then, you dip an item in a fabric dye for some time for the dye to take hold in the fabric. The areas that are twisted or banded tightly will have no dye or faint traces. Once you remove the ties, you will find unique patterns on the fabric based on the way it was manipulated and bound. No matter what technique and colors you use, every tie-dyed item will turn out different. 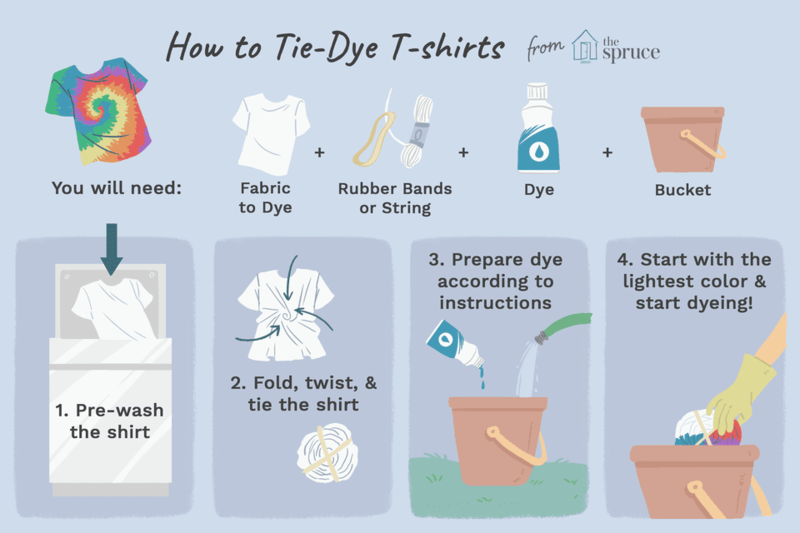 There are four things you will absolutely need in order to do a tie-dye project: the item to dye, the dye, the ties, and a receptacle for the dye. Carefully read the package your dye came in to see if you will need any other supplies. Item to dye: The most common item is a T-shirt, but you can dye just about anything like pants, socks, scarves, handkerchief, pillowcase, sheets, curtains, tablecloth, and so on. You just need to make sure that the item you wish to dye is made of at least 60 percent cotton. Dye: There are different kinds of dyes you can use in your tie-dyed projects. You can order the dye online, find specialty dye at craft stores, or even grab simple RIT dye found in most grocery stores. RIT is great for three reasons: 1) It works well with most fabrics, 2) It is readily available, and 3) Each color costs just under $3 per box. Or, you can also buy kits made especially for tie-dying or try Simply Spray. Something to tie with: You will need rubber bands or string to tie up the item you will be dying. After all, the tying is what makes all of the cool, one-of-a-kind designs. Large pot or bucket: You will need a large three to five-gallon pot or bucket to mix the dye and soak the item. The dye may stain the receptacle, so make sure you use something that is old or is OK getting stained. There are four necessities—that every tie-dye job requires—but beyond that, there are a few extra supplies that can be helpful. These involve assisting with clean up, tools, and some dye enhancers. Ease of cleaning: To protect your hands from staining, you will want rubber or plastic gloves. You might want to wear an apron or old clothes that you might not mind getting stained. To protect the floor of your work area, get old newspapers or open and flatten a large plastic garbage bag and line the floor. Have rags, paper towels, and spray cleaner handy to use immediately if spills or splashes occur. Tools for dyeing: Some dyes can be applied with squirt or spray bottles, you might want to have some empty ones for this purpose. To keep your hands off the items, but to help with dipping and stirring, you will want a giant spoon and large barbecue tongs. Also, you might need a clean, empty plastic bag. Some dyes require the dyed item to sit in a plastic bag for about 24 hours to absorb the dye. Dye enhancers: You can get soda ash or sodium carbonate, which is an additive used with some dyes to pre-treat the items that are going to be dyed. It helps create more vibrant colors. Another color enhancer is simple table salt. You can add it to RIT dye to make darker colors appear more vibrant. Before you dye your item, you should wash it to remove any sizing from the manufacturer or anything else that may have gotten on it. Pre-treat your item if necessary. With some dyes, you will have to soak it in soda ash. Decide what design you want your finished project to have, for example, you might want a tie-dyed T-shirt featuring a spiral design. Cover your work area so the dye does not stain it. Prepare your dye as directed by the manufacturer. You should carefully follow all instructions. Lay your shirt or other items out flat first and then fold and tie it as desired. Start dyeing. It is usually best to start with the lightest color if you are using more than one color. Rinse or wait between colors as directed by the manufacturer. Some dyes require you to rinse immediately and others require you to let the item sit for at least 24 hours. When the dyeing is complete, make sure to clean all containers immediately with hot water and soap. Be careful when machine washing your tie-dyed items. Most should be washed in cold water. The first few times they are washed, they might bleed, so wash them with like colors or alone. The exact directions you follow will vary depending on what brand of dye you use. Read all instructions and precautions on the package carefully.